There's no doubt that something has impacted popular culture when it becomes a verb. 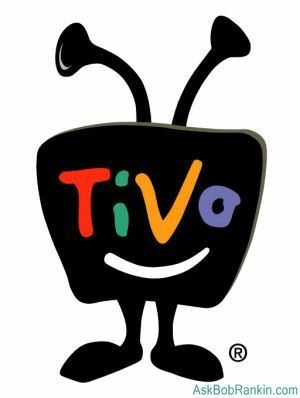 Xerox, Google, and now Tivo are all action words. So if you have not yet gotten with the program, literally, maybe now is the time to join almost four million others and take control of your television. TiVo is a digital video recorder that will record every episode of your favorite TV show, so you can view them when you want. You can also control your viewing in real time or recorded shows with rewind, fast forward, pause, slo-mo or instant replay. And everybody's favorite TiVo benefit is that you can skip right over the commercials when watching a recorded program. That's a big time saver, typically shaving 20 minutes off the viewing time for a one-hour show. The onscreen guide connects to your TV service provider so you can search the listings by title, actor or category. If you record a show and the program changes its time slot, your TiVo will adapt and continue to record it. You can also select movies or other specific channel content such as sports, news, music, etc. And after watching a show, you can grade it with a thumbs up or down on the remote and the clever device will suggest other programs that you may like. Did I mention that you can zap the commercials? There are several different TiVo models and subscriptions available. Let's start at the low end. The Series2 DT DVR can save up to 80 hours, record 2 programs at the same time, is compatible with cable and satellite systems and has an MSRP of $149.99. But beware, this model does NOT support high definition TV. The next least expensive model is the TiVo HD DVR. You get a whopping 180 hours of standard video or 20 hours of HD programming. While this one doesn't support satellite, it is compatible with your antenna and cable and carries a price of $299.99. Top of the line is the HD XL DVR. While it only holds 150 hours of content, it is THX certified for excellent audio and video and includes a premium remote. The cost is $599.99. The company also offers refurbished models at a reduced rate, if you're willing to take a chance on iffy hardware. Monthly service is only $12.95 but other plans are available. Pay for a year's worth at $129.00 and it knocks it down to $10.75. Three years will cost you $299.00 and the price is only $8.31 per month. And if you get a large tax refund this year, $399.99 will provide you with free service for the life of your TiVo. What About the Free TiVo Basic Service? I should mention that in addition to the TiVo plans that require a monthly fee, there's also a TiVo Basic option, which is free. But unfortunately you can't just buy a TiVo unit and get TiVo Basic. For reasons that remain shrouded in mystery, you can only get the free TiVo Basic service if you buy certain Pioneer or Toshiba DVD Recorders. This free service gives you a limited 3 day program guide, manual hard disk drive recording up and control of live TV with pause, slo-mo and reverse. It will also allow you to watch a recorded program while the device is finishing the recording. What you will not get are the Tivo Plus services of the Season Pass, WishList Search, or online scheduling through the USB connection on the back of a TiVo box. If you decide you want to upgrade your player/recorder at a later date, that is possible, too. Since I've mentioned non-TiVo DVR devices here, I'll also point you to a companion article Which DVR Should I Get? to help you decide if you should get a Tivo, a store-bought DVR, or DVR service from your TV provider. TiVo KidZone is there for the little ones. They will recommend shows from such organizations as the Parent’s Television Council and Discovery Kids. Needless to say, you can limit your child's viewing if you feel there is questionable content. The company recently added Netflix to its programming capabilities for those who have an unlimited plan with the service and certain models of TiVo. This gives you access to over 12,000 movies and TV episodes on an instant queue. You can receive two weeks of Netflix free to give it a try. In addition, the service gives access to YouTube, Rhapsody music, Nero Liquid TV and other online stations. The company is big on customer service. Their website is full of information concerning usage with many videos, billing issues and helping you decide which TiVo model will work with your existing service. One thing is sure. You can save money with a TiVo if you have cable as you will no longer have to rent a cable box. The DVR uses one or two CableCard decoders for only a couple of dollars per month and you actually own your equipment. And there are always specials such as free limited subscription with box purchase. Most recent comments on "What is TiVo?" It must be 10 years ago that a friend bought a dvr with a built in HD and began "TIVO'ing" shows for no cost. A couple of years ago I went looking for the same thing, not wanting to pay TIVO a monthly charge. Apparantly TIVO has rights to this combination, as no DVRs were available with either an Internal HD or connections for an external one. What's that all about? So I waited, and last year the problem was solved by my new HP oomputer with built in HDMI multimedia interface. Now I have HDTV with TIVO capability for recording to my internal and external hard drives for free. How come you did not mention this free option to get around the TIVO monthly charges? Am I missing something? EDITOR'S NOTE: Please tell us what hardware and software you're using to record HD TV programming to your hard drive. And this is not the only option... the Panasonic and Toshiba DVRs have hard drives, and can be used without TiVO. Because I could find no store selling a DVR with hard drive storage, I assumed that TIVO had rights or a patent on that combination. Does anyone know? You say Panasonic and Toshiba have hard drives? If you can record TV shows in TIVO like fashion for free, this is news to me, as no store in MD were selling them last time I looked. Meanwhile, my HPw2408h with HDMI (High definition Multimedia Interface TM) came with Windows Media Center software which includes TV and Movie guides whose shows I click on to schedule a recording to the computers hard drive. That was what I wanted that I could not find anywhere other than TIVO with its monthly charges. EDITOR'S NOTE: It does appear that Tivo is the only game in town, when it comes to DVRs with a hard drive. I don't think it's a patent issue, because cable and satellite TV companies offer non-TiVo units for rental. If you get an LG plasma or LCD TV, it comes standard with an integrated DVR which they call Time Machine. I believe it uses an 80GB drive, but the capacity can be expanded indefinitely by connecting external drives to the USB ports. I have Directv, and I "acquired" their HD-DVR (Tivo like device) and it works great and is very easy to use. I can record 2 shows simultaneously or record one and watch another program. Basically it has all the same capability of a Tivo. Now the interesting part of the equation. I "purchased" the DVR at BestBuy, but apparently I do NOT own the device. But, I'm not paying a monthly fee for the device either. I do pay for an extra "receiver" because it does require a second input from the dish be connected to the DVR. I pay $5 per month for the extra receiver input along with my other regular monthly charges. EDITOR'S NOTE: Why do you think you don't own the DVR? If you cancel your DirecTV service, will they demand that you give them the device? I agree with Jon. I have tried my cable company's DVR. I also spent a week at my sister's house using her DirecTV HD DVR. Although both devices were easier to use than a computer with the software and hardware added on to approximate a TIVO, they still didn't compare to the real thing. I have DirecTIVO, it is a DirecTV receiver with a TIVO built-in. Even though I own HD TVs I wont pay for HD service from DirecTV until they release their true TIVO service in HD. They say that will come this summer. I've had my Tivo for about 3 years, and I wonder why I ever bothered with TV previously. I get to see shows that I couldn't access before, and the Tivo interface is very well designed. I agree about the Tivo website and community. The few problems I've had have been answered very quickly. I managed to upgrade my Tivo 2 to a much larger drive, making it an even better deal.